Context: Working groups have been already identified and are expected to act within a well defined strategic framework with shared and clear goals. Needs: Everyone should share their values and motivation. Activities: Starting from a shared strategic goal, participants are invited to recognise their own and others’ contribution and value. Turning a group of people into a productive team, solving the conflicts that affect dysfunctional teams, merging competencies and capitalising on relational capital and on people, are the key factors to success for every organisation or working group that aims at achieving their goals effectively by improving processes and practices. An organisation is made up by many people, but a group of individuals is not a team. A team is that where people cooperates and collaborates together toward a shared goal. Building a team means sharing values and knowledge on the basis of a trust based relationship that highlights everyone’s contribution and importance. A team, compared to a group, is the true resource of an organisation and it represents the key factor of a successful project. 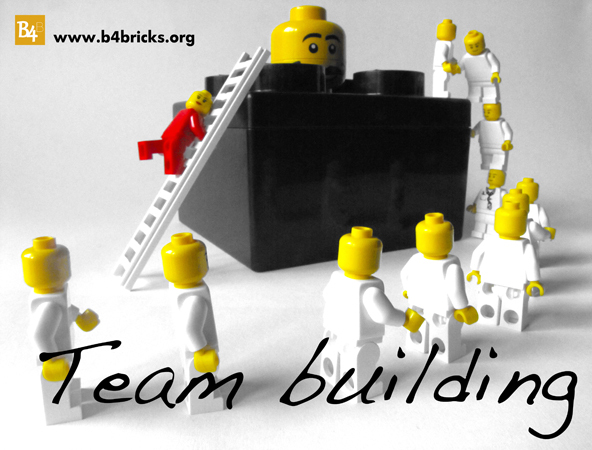 Team building requires that all individuals are involved in the process and feel they are part of it. Members of a team share their knowledge and visions in order to create a sound relation based on trust, respect and mutual recognition. A team defines and develops collaboratively the goals and works together to achieve the goals. A LEGO® SERIOUS PLAY™ method based workshop involves all participants by inviting them all to build, share, discuss and negotiate their own individual visions so that at the end of the process they can build together an unique value and goal which has been negotiated and agreed on by everyone and which will represent the teams’ guiding principles. Constructive sharing and the building activities involved in the workshop represent an effective way to delve into individual perceptions and to share experiences and ideas through metaphors that represent real situations and let the team members’ challenges and difficulties to emerge. During a workshop models and landscapes are built to share knowledge and experiences, and beside constructing models, participants build trust, relationship and respect among team members. The overall process improves their interaction and relationships, overcoming tensions and misunderstandings that are a real problem when it comes to collaboration. A one day workshop can radically change the perspectives and turn individuals into teams because whatever an organisation or a team may need, it is already available within the organisation and the team itself, even though sometimes new relational and communication processes are needed in order to improve the practices, since, especially in complex and structured contexts or within heterogeneous teams where several visions, experiences and needs meet, such collaborative practices are not spontaneous ones. A LEGO® SERIOUS PLAY™ methodology based workshop highlights everyone’s contribution, constructs a common language for a better sharing and cooperation, builds a shared identity, defines the goals and improves processes by establishing trust and relationships that have a positive impact on everyone’s participation. Working group members, temporary working groups and those teams that need to incorporate new skills and people to perform more efficiently and to improve performances. Because goals and results are collectively defined, following actions will be carried out collaboratively and competencies will be merged, as it should be in a team! This entry was posted on May 3, 2013, 7:23 am and is filed under Percorsi. You can follow any responses to this entry through RSS 2.0. You can leave a response, or trackback from your own site.